Hello fellow Savvy Southern Style fans! I'm Brenda from cottage4c, and I'm so happy to be sharing my favorite room with you. I adore Kim's style and was thrilled to be invited to join you today! I chose my living room as my favorite. I think it's the room that most reflects my style. It's comfortable, has some vintage and eclectic pieces that I love, and best of all - it's a finished room!!! I'm finally to the place where the only changes that I make to the room are seasonal. (Besides the occasional new accessory!) It's a great place to arrive at. Only 6 more rooms to go! Our cottage is small. The living room is our main gathering space, and the 6 of us almost fit in here to watch movies. :) We don't have a giant flat screen which is fine because I would hate to give up this armoire. I painted it a couple years ago and still love the color. I bought the old tin ceiling tile beside the armoire at antique store for $5. It's the perfect place to hang a wreath. This is Zoey's couch. She's supposed to be laying on the other cushion (on the blanket!). I found the wagon and fire blanket box from antique stores as well. 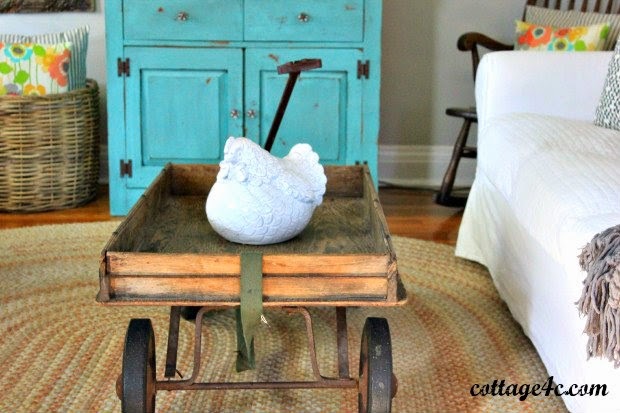 The wagon is my version of the big industrial cart coffee tables that I love but wouldn't fit in this space. I don't usually keep accessories on the wagon because there's usually feet propped up on it, or it's being wheeled out of the way for cartwheel practices. My husband gave me this fireplace gate at Christmas a few years ago. It's one of my favorite things. I love the old double-loop ornamental fencing! And who can resist that rust? haha I think that I have black and white check fabric in almost every room - I love it! 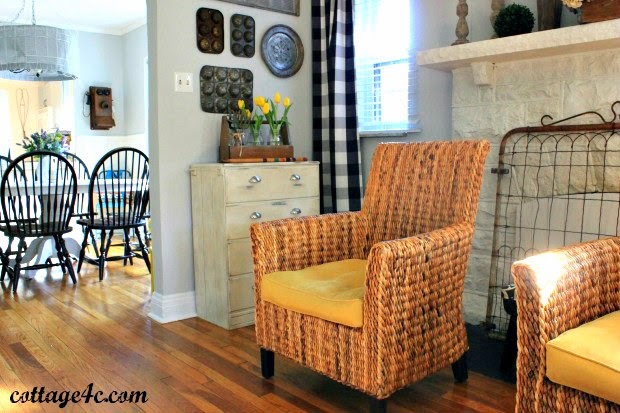 I used to have chairs covered in checked fabric in front of the fireplace. 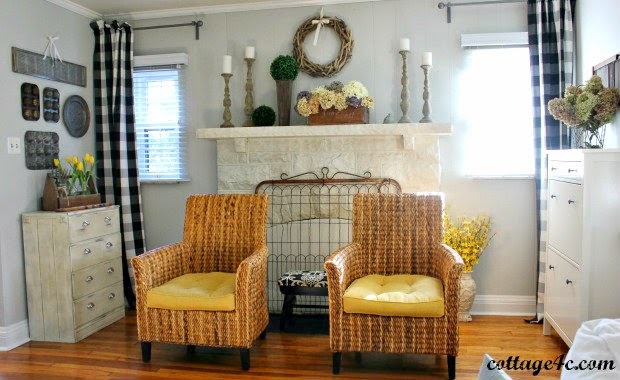 When I moved the chairs to a different room, I really missed the look, so I added buffalo check curtains. The large muffin tin was given to me by a friend (it was her mother's). I loved the look of it so much that I've picked up a couple more. Here's a peek into the dining room - and kitchen just beyond that! Did I mention that our house is small? I love using vintage pieces (obviously!). You can't beat the green color and patina on these old gardening tools. The wooden stakes are from a croquet game. And thank you spring for fresh tulips! This is another of my favorites. 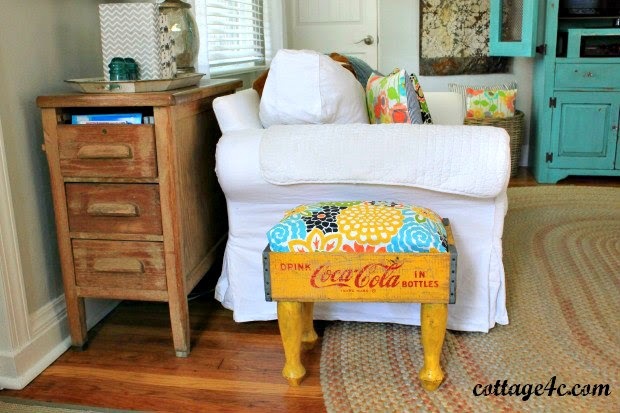 I needed a small footstool so I made this one out of an old soda crate. (The cushion recently got a summer update!) The crate inspired me to add a few more touches of yellow to the room, and they make me so happy every time I walk in the door. I hope that you all have something that makes you smile when you walk into your homes! I hope that you enjoyed the tour. Thanks so much for the invitation, Kim! Thanks, Brenda for sharing your cute favorite room with us. Don't y'all just love her colorful style? If you want to see more I hope y'all will pop over to Cottage 4C and say hi. I hope y'all have a wonderful Easter weekend! How pretty! I love the pops of color throughout, as well as the muffin tins. It seems like a lovely room for the family to congregate. You know, they say families in small houses learn to get along better (probably because they have to!) Your home is charming. Love Brenda's favorite room...I used use my old wagon as a coffee table years ago...I love that look...and love that cute Coca-Cola stool!...So many beautiful and creative touches in the room...and I so heart that fireplace gate!...Thanks Brenda and Kim for allowing us to visit this beautiful, cozy room today....Happy Easter you both...thanks Kim again for another great Favorite Room....Happy Easter!!! Oh my gosh! So pretty! 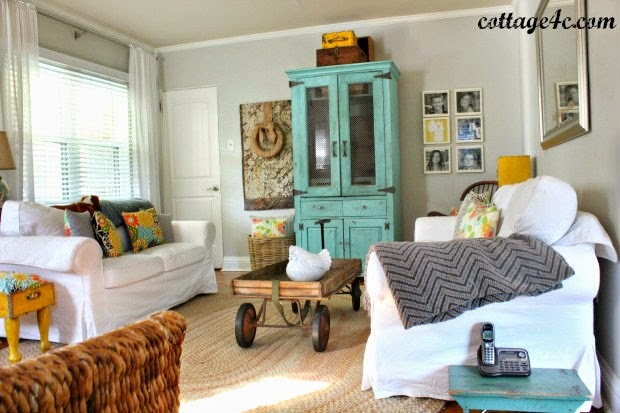 Love the green cabinet and the wagon coffee table. So many great ideas! I love Brenda's quaint room and I know you must love her Buffalo checked curtains! Beautiful home. It reminds me of the good ol' days without being old. Love it and thanks for sharing! I love it all, such a beautiful cottage! So many cute things, and great vintage finds!! Love the pops of turquoise. They are really fun!! Such a bright and cheery room. Thanks for sharing ladies. What a creative decorator! Is she clever or what!?! 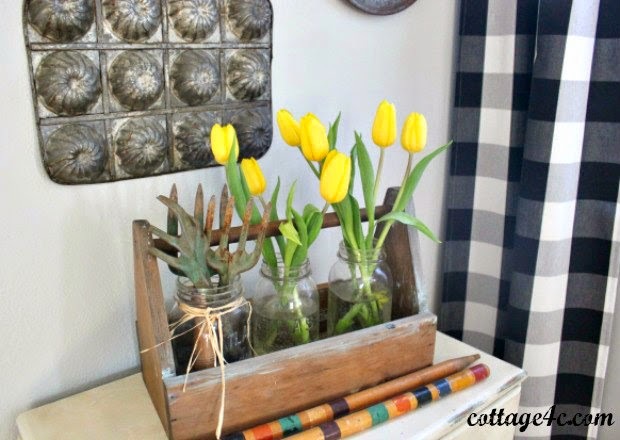 I absolutely LOVE how she repurposed things like the croquet stakes, garden tools, and muffin tins. Brenda's innovative style is very inspiring! Thanks for featuring her, Kim! love this quaint little place. we would never leave if this was oursw. Brenda what a pretty room and it was great to meet you. I love that cabinet too and wouldn't want to get rid of it either. I love old ceiling tins. Yours is nice and large and the wreath hanging is perfect. Cute, cute home, Brenda! 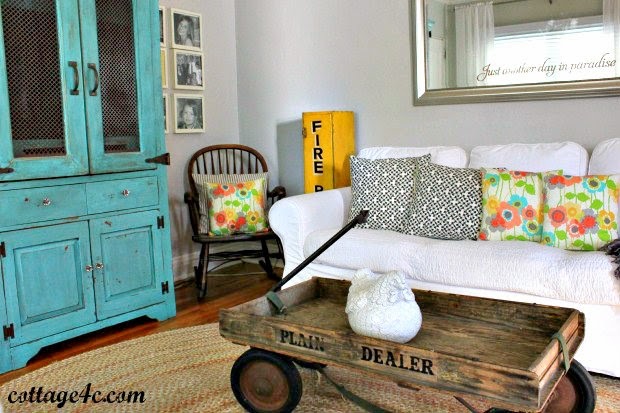 Love all of your vintage goodies that make your home so warm and unique. And Kim, I'm hoping you're healing. Such a scary place to have a deep cut. Brenda, I love your style! I too, love black and white check! What a wonderful room filled with fabulous, unique pieces and lots and lots of character! Thanks so much for sharing you talent and decorating style with us today! Kim, thanks for introducing me to Brenda. Now I'm off to check out her blog! This is really a fun post. Such clever Ideas. Thanks so much for sharing Brenda's favorite room. 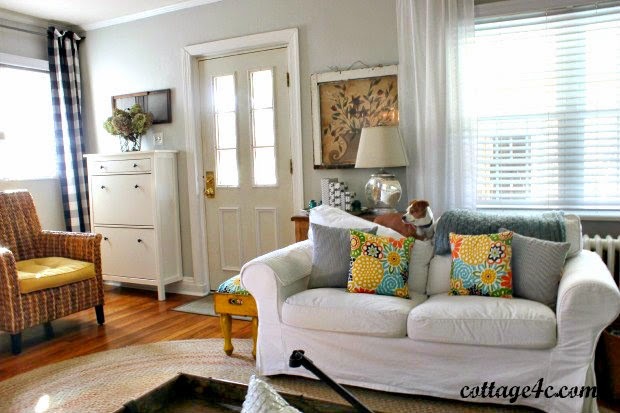 Love her style and beautiful cottage filled with so many great vintage pieces and pretty pops of color, especially that gorgeous painted armoire! Wishing you a very Happy Easter!